We invite you to check out the Silver Jewelry Store we have available by following the links to the left side of this page. This is a photo of our Silver Jewelry Store was taken from the Hwy, we have had this old medicine mans wagon for over 35 years but we had "World Famous Turquoise" painted on it in 1976. This is our brick and mortar Silver Jewelry Store and we run our online Store from this location as well. There are over 3,600 Deer Antlers in the Arch in front of the Silver Jewelry Store building. 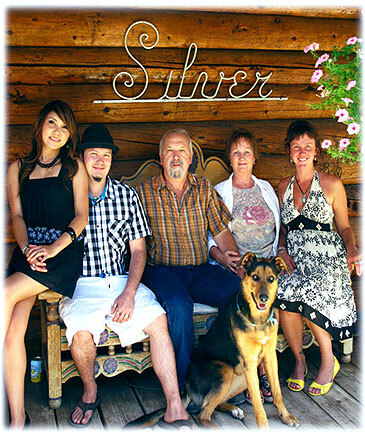 This is the Hartman Family on the front porch of the Silver Jewelry Store in 2011, from the left is Nattarika, Dillon, John, Estell and Crystal - Lola is Crystals Dog, she is so smart. Dillon and Nattarika now have a Black Lab named Lander (Lander Blue) and John and Estell have Lander sister Daisy, she is a yellow lab - we love our dogs! Above and to the left is a Bracelet was originally designed by John Hartman for the Fred Harvey Silver Jewelry Store at the Grand Canyon in the mid 1970’s. We brought it back in a limited edition to our own Silver Jewelry Store in Durango and on the Internet. John designed about 80 pieces of “old style” Navajo Jewelry that the Fred Harvey Company Silver Jewelry Store sold at the Grand Canyon. To the right is a Bisbee Turquoise Necklace set handmade by Dillon Hartman. This deep blue, Smoky Bisbee Turquoise Necklace set recently sold in our Online Silver Jewelry Store to a very lucky person. 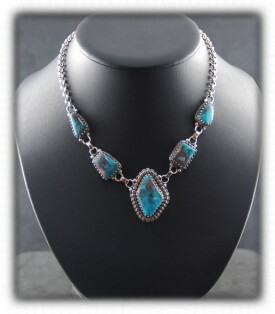 The Bisbee Turquoise in this Necklace is top gem grade and extremely rare, it will be a wonderful investment for its new owners. 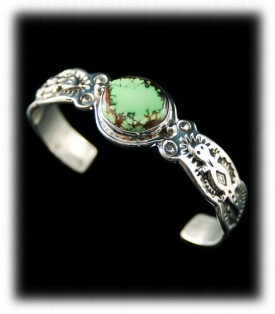 Bisbee Turquoise has become so rare that the Durango Silver Jewelry Store is one of the only places you can find it. 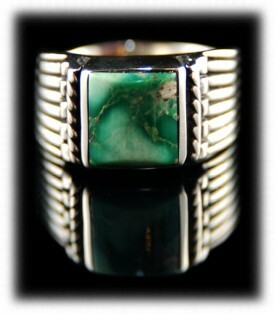 To the above left is a Contemporary style Sterling Silver Mens Turquoise Ring by Dillon Hartman. This is one of many Silver Mens Rings in this style that Dillon continuously makes to sell on our online Silver Jewelry Store. This mens Turquoise ring was made in the saddle ring style, meaning it is completely round on the inside, this makes this men’s Turquoise ring extremely comfortable. Visit our Silver Jewelry Store often to see the awesome new Mens Saddle Rings as they become available from Dillon Hartman. Above and to the right is a beautiful Inlaid Silver Bracelet that was recently sold in our online Silver Jewelry Store, it was made by Edison Yazzie. There are forty two individual gemstones inlaid into this very unusual sterling silver cuff bracelet handcrafted by Edison. 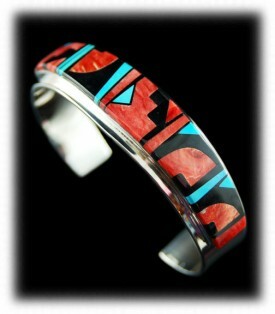 We try to always have a good selection of Edison Yazzie's inlaid Jewelry in both of our Silver Jewelry Stores. You will always find a large selection of silver jewlery in all designs in ouf Silver Jewelry Store. We specialize in Sterling Silver Ring Bands, Silver Cuff Bracelets, Silver Necklaces and specialty Sterling Silver items, not just Turquoise Jewelry and Gemstone Silver Jewelry. We invite you to take a look at a few of our other presentations - Native American Silver Jewelry, Silver Jewelry Learning Center and our Silver Gallery page. We invite you to learn more about our Silver Jewelry Store and American Silver Jewelry by following the links in our Learning Center to other informational pages we have written on different topics directly related to Silver Jewelry. In addition, we would like to invite you to join our E-Mail Newsletter - about once every other month we send out a Newsletter to inform our members of what's happening with Durango Silver Company, new products, specials for our members and more. We also have a monthly drawing from our member base to give away free Silver Jewelry from our company. Please take a moment to become one of our friends by signing in below. We hope you have enjoyed our presentation on Silver Jewelry Store and have gained some useful knowledge from it.